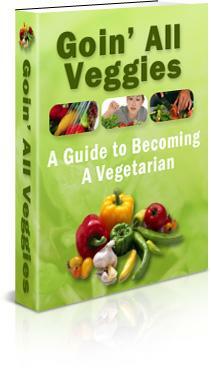 Who Else Wants to Discover How to Quickly & Easily Become a Vegetarian - & Enjoy All the Benefits That Accompany It? Do you feel good most of the time? Do you wake up energized (as opposed to feeling tired and sluggish)? Would you say your overall health is good? Is your blood pressure in the healthy range? Are your cholesterol and blood sugar levels normal? If you answered "no" to one or more of the questions above, then this is definitely the most important letter you will read today! * On a balanced vegetarian diet one can very easily lose weight and stay fit. * A vegetarian diet fights against cancer, including gender-related cancers such as breast cancer, uterine cancer, and prostate cancer. * A vegetarian diet helps fight against heart disease. * A vegetarian diet helps you avoid some illnesses caused by e coli, salmonella, and listera, which are the most virulent forms of food-borne illnesses. * As far as money is concerned, it's much cheaper to buy vegetarian food than quality meats and fish. * Eating vegetarian is not only healthy, it's good for the environment as livestock deplete enormous land and water resources.